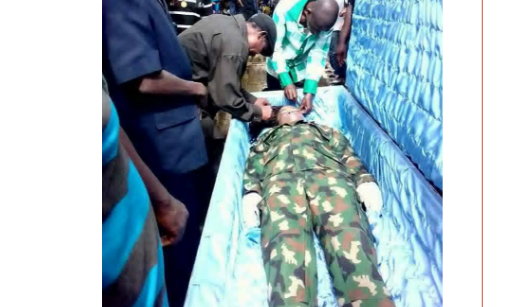 The female soldier who died in a fatal accident on October 10 in Rivers state (a day before her birthday), has been laid to rest amid tears at her hometown in Sagbama area of Bayelsa state. Salo Roseline Tamarabrakemi, was killed in a fatal accident involving a vehicle and the motorcycle she was on while going to a market at Elele, Port Harcourt, Rivers state capital - to get things for her birthday which was the next day (Oct 11). She was buried today amid tears as her colleagues, friends and family were present.